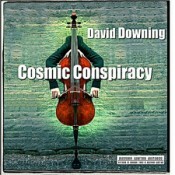 Armed with just his cello and a looping station, David Downing bridges classical, post-rock, New Age and a bit of experimental music on his second release, Cosmic Conspiracy. The cellist takes a real chance straight out of the gates with “Whale Song” by rasping near-dissonant harmonics out of his strings to quite effectively simulate said sound. As the piece settles and rectifies itself into a beautiful set of descant tones over a rising drone, it becomes more accessible–but I can see unadventurous listeners heading for the exits before Downing can fully have his say, and that would be a mistake. Getting through these somewhat harsh sounds is well rewarded halfway through the track when it shifts into a more accessible rhythm-and-melody mode, introducing itself on pizzicato notes. Dan Kane lends assistance with beats and keys and the piece settles into a pleasant New Age groove. This is the first taste we get of Downing’s unadulterated playing and it is smooth, rich and emotive. This becomes the overarching tone for the rest of the disc, a fresh space that mixes an identifiable New Age timbre with the vivacity of modern classical music. “The Storm” and “Mérida” represent the latter. “The Storm” wraps the listener in a Steve Reich-like haze of rapid-fire repetition, a showcase of Downing’s technical playing. Hard shifts of tempo jump in and out of these flurries, punctuated by a deep bass note–they’re like reminders to take a breath. “Mérida” is something of the darker cousin, coming in all melodrama and fiery passion, spinning its own sometimes challenging take on the rush-and-break structure. Late in the track it exudes a sad romance, high, crying lines carrying over a brusque and raw rhythm. Very affecting. “Sarah’s Song” heads in the opposite direction, a post-rock ballad composed in loops. Again Downing’s lyrical plucking takes the fore, and his silky bowed sounds sing gorgeous counter. Very accessible, and my favorite piece here. Great crossover potential. The title track falls in the middle, wrapping all the elements we’ve heard into a single theme. It opens as a slow ballad, then picks up pace as the composer begins to lay in his loops. It feels quite like an intimate chamber group exploring a new canon infused with a soul-lifting exuberance. Cosmic Conspiracy has grown on me over repeat listens to become a release I quite appreciate on a number of levels. It may have been “Sarah’s Song” that hooked me first and foremost, but each of these five tracks has left its mark. Downing is a passionate, skilled player who’s quite at home with looping. There are no hard jumps here, no glitches of timing. Just rich acoustic music that needs to be heard. Give this one a try. Available from Russian Winter Records.